This is going to be an interesting week. I’m starting my proper research on the Marian ballads. So far I’ve written quite a bit about two of them – I’m splurging so that I can go back and edit all my ideas later. But there’s a lot on this week. I have various meetings and appointments to go to about the children, and the usual ferrying them around to Cubs, Brownies, cricket nets and things. I’ve also got to pack for our holiday, which I promised I would actually take as a holiday…. It remains to be seen how I manage without my research. There’s plenty of reading material on my kindle, if I get desperate!!! I’ve got nearly an entire issue of Past and Present downloaded onto it, which I can legitimately describe as leisure because it was a special issue about relics, so not directly related to my research! I haven’t heard from my supervisor since I sent her my work, so I’m not sure what’s happening there. I expect I will need to see her this week too. I have been playing about with my blog theme – I’d written two other pages but the theme I was using didn’t show them. I’m not entirely satisfied with the new one, but at least you can see the page about me and the page about my secondary reading material, which, at the moment, doesn’t have much written on it. I’m going to carry on playing this evening to see if I can find anything I think is more suitable. 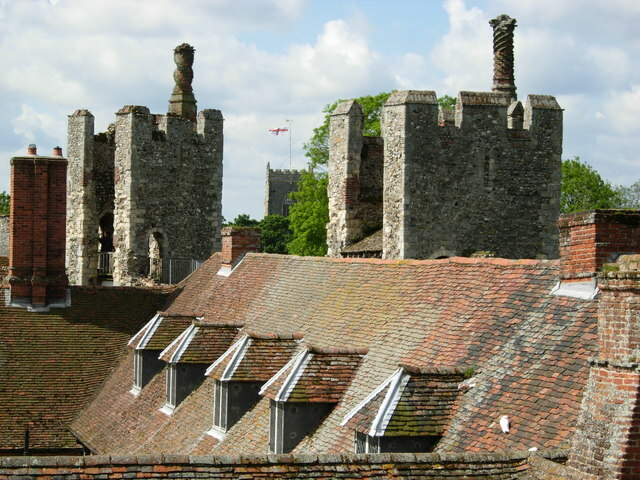 In the meantime, the photo on the header is detail of Framlingham Castle. Just in case any of you are interested, I spent more than three hours in casualty this morning getting my ribs checked out, and having had an x-ray the doctors think they are probably not fractured. So they’ve given me stronger painkillers and told me to rest, which is fine by me. And as I have a sedentary lifestyle, I will still be able to do some research. At least, I assumed I would. The trouble was that an hour after taking my first dose I started to feel most peculiar: dizzy and woozy and a bit nauseous. It took me about quarter of an hour to realise that it was probably the painkillers, not the effect of reading Alice Hunt’s thesis, and I settled down for a nap on the sofa. I felt a bit better when I woke up. So I guess I’ll have to see how it goes over the next few days. On the plus side, while sitting around in casualty I finished reading ‘Philip of Spain, King of England’ by Harry Kelsey. Suffice to say that I will stilll wait for the definitive biography that Glyn Redworth intends to write. And then I fell down the stairs. I slipped off the top step for no apparent reason and slid all the way down the stairs on my back. I don’t recommend it. For one thing it is, as a friend put it, undignified. But for another, it’s hellishly painful. And what’s more, despite the excruciating pain in my ribcage, there is only one tiny bruise, and that’s on my bottom! I should have been at Bolton Local and Family History Day today, but I wasn’t. I’ve had a relatively quiet day today, as doing anything for a prolonged period is very painful although I now feel more or less fine when I’m sitting down and resting. The paper on top of the printer is work for the Bolton Historical Association. 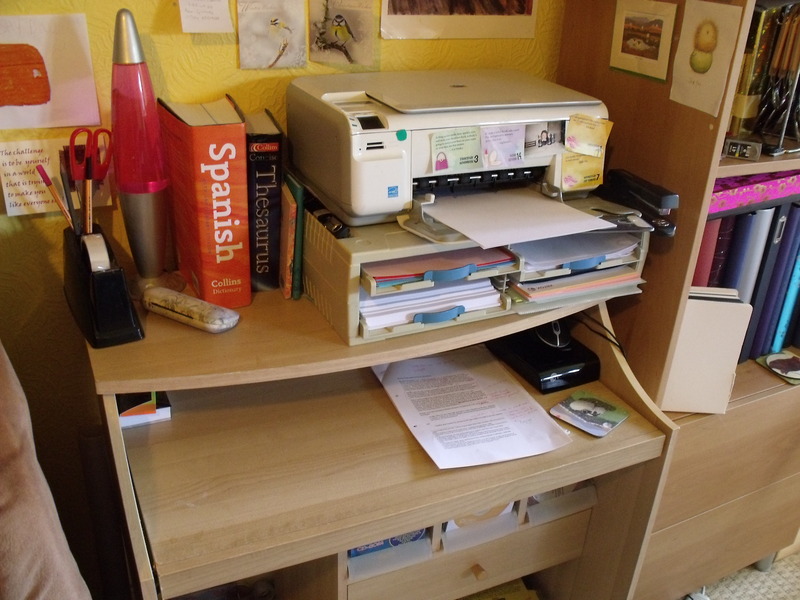 Beside the printer are my reference books, pens, flash drives, some old HA lecture programmes and a Geoffrey Elton. 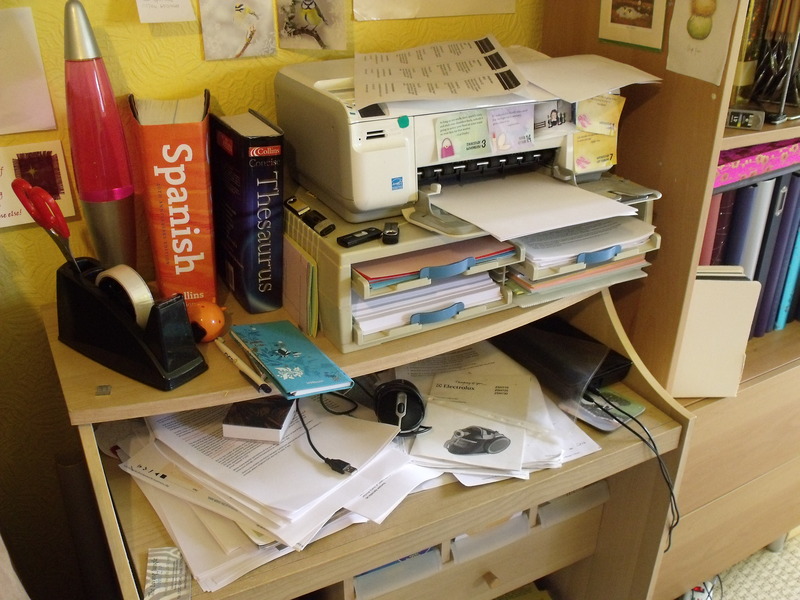 As for the contents of the desk itself, it included notes for my thesis, the instructions for my hoover (it needed a new filter so I’d vaguely considered the need for a part number), programmes for a couple of conferences, some of the children’s pictures and bits of hardware for my laptop. Now it looks like this. The bits of paper that are left on the desk are the current draft of my essay and my Inventory, as described in the Detox Your Desk post. I was quite pleased with myself.Now, if I’m honest, one of the reasons that I have a problem keeping my desk clear is the children, and that in itself breaks down into two issues: the first being their habit of leaving their bits and pieces on my desk and/or presenting me with their pictures while I’m working; the second being that I often have to suddenly clear the dining room table at short notice while I’m working on things – the easiest place to move them to is my desk. In a way, realistically, my desk is really the dining room table! But nevertheless, I was chuffed that everything was in its place and I had carefully planned out my work for Tuesday. Tuesday went off quietly enough. On Wednesday I went into university and worked hard for a couple of hours before going to my Alexander class and then picking up some books from the library and heading home. Then on Wednesday evening…. bump, bump, bump.